ZIMBABWE – Former vice-president Joice Mujuru believes her successor Emmerson Mnangagwa is tasting his own medicine after First Lady Grace Mugabe turned on the Midlands strongman on Friday, accusing him of plotting against her husband. Grace accused Mnangagwa of a plethora of things, including linking him to an alleged plot to kill her son — Chatunga — and the recent attempt “to bomb” her Gushungo Dairy in Mazowe. She has threatened to reveal more information allegedly exposing the so-called plot against Mugabe. The setting for the attacks against Mnangagwa — a rally in Mazowe South — and the language laced with innuendos and hate speech had a striking similarity to Grace’s unrestrained attacks on Mujuru in 2014. Mujuru, who on Friday registered her own political party — Zimbabwe People First (ZPF) — said she does not feel any pity for Mnangagwa. The VP is believed to have been one of the architects of Mujuru’s demise after years of jostling for control of Zanu PF with the war veteran. 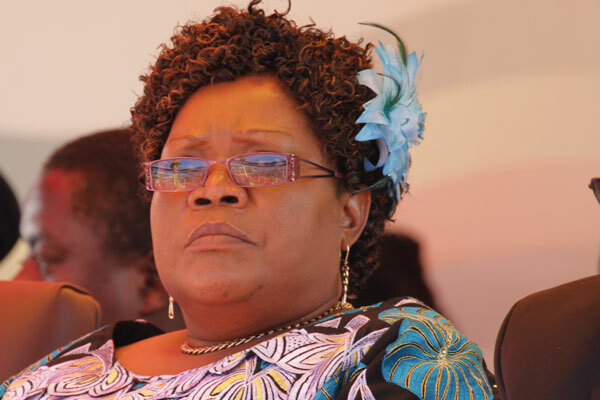 “I have no advice that I would give him,” Mujuru told The Standard. “They were together when lies were peddled against me and many in the party, so he is just having the same treatment that I got and they are tasting their own medicine. “They knew that all that was being said about me were lies, but they believed it; that is when I realised that a huge disaster was imminent in Zanu PF because the leadership allowed it [my persecution] to happen. Mujuru said Mnangagwa was welcome to join ZPF party, but on condition that he starts from grassroots. Mnangagwa took over from Mujuru in December 2014 after she was kicked out of the party on allegations of plotting to kill Mugabe through consulting witch-doctors, among other accusations. She denied the allegations and challenged Mugabe to prove the claims in court. At the time, Mujuru described the charges as politicking by those who wanted power at all cost. War Veterans minister Christopher Mutsvangwa, a key Mnangagwa ally, was also singled out for a tongue lashing by a visibly angry Grace on Friday. Zanu PF is divided into two distinct factions, with one backing Mnangagwa and another G40 which reportedly has the backing of the First Lady. Mujuru said the chaos in Zanu PF was a sign of a failed leadership but vowed never to return to the ruling party as she was not fully committed to ZPF. “That is what they wanted (destruction of Zanu PF) because the leadership allowed it to happen,” she said. When everything is done, the party will be launched and we will let you know,” she said. In her parting shot, Mujuru said Mnangagwa would not qualify for a top post at ZPF. “He will have to go to his province that is where he will be entertained not at our position (national),” she said. Like Mnangagwa, Mujuru was at one time being tipped to succeed Mugabe who has ruled Zimbabwe since independence in 1980.